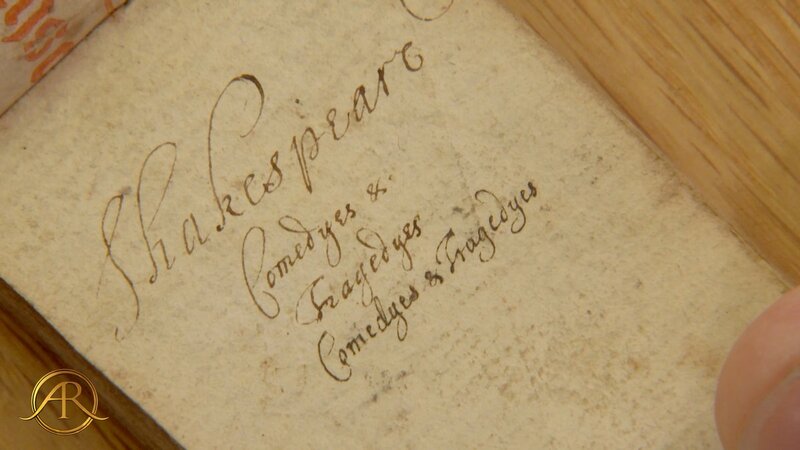 The BBC Antiques Roadshow has often featured items with a Shakespeare connection, but on Sunday 2 April 2017 we saw “one of the most remarkable items to ever feature on the Antiques Roadshow”. Its appearance had been widely anticipated and was even thought by some to be an April Fool since Tweets had started to appear on April 1. 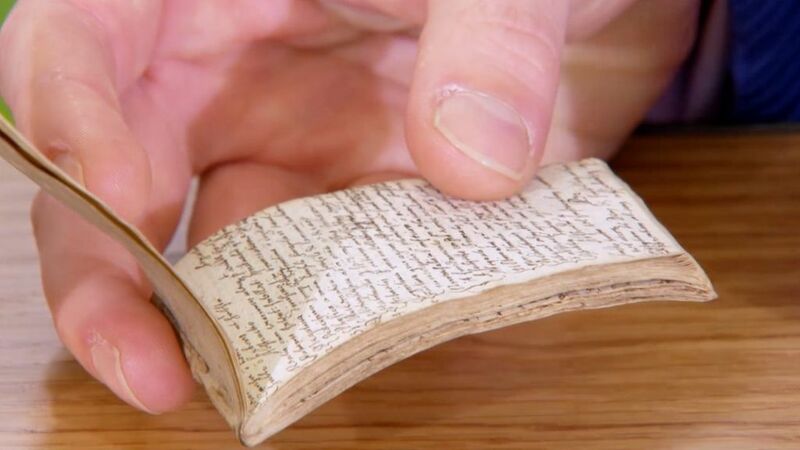 The object was a tiny commonplace book, written in a seventeenth century hand, on the subject of William Shakespeare’s Comedies and Tragedies. The gentleman who brought it in was a distant descendant of eighteenth-century antiquarian John Loveday who lived at Caversham Court where the programme was coming from (currently used by the BBC). He had found it among his mother’s possessions. Loveday had a library of 2,500 books and this was thought to have been acquired by him. The notes were written “by an unknown seventeenth century William Shakespeare scholar”. We were treated to tantalising glimpses of a few pages but not enough to really get a sense of what was written, which the owner said he had never been able to read. Manuscript specialist Matthew Haley claimed to be trembling with excitement at handling this little object, and we can be sure that academics will be queuing up to examine it properly. He placed a value of £30,000 on the book. Any new discovery relating to Shakespeare always creates huge interest, even when, like this one, it seems to have no direct connection to Shakespeare himself. Its value will probably be in providing evidence of how Shakespeare was received during or shortly after his lifetime. As Matthew Haley thought, interest was immediate, with a number of Shakespeare academics Tweeting about it almost as soon as the piece had finished. It’s to be hoped that the commonplace book, or rather high quality photographs and transcriptions, will be made available to academics. I look forward to hearing more about this terrific find! This entry was posted in Shakespeare's World and tagged Antiques Roadshow, Caversham Court, commonplace book, John Loveday, Matthew Haley. Bookmark the permalink. “Mr Haley, who appraised the “extraordinary” item at Caversham Park on Sunday’s episode, said it features *a critique of the playwright’s work*, *detailed notes* in Latin and some of Shakespeare’s own phrases. how can it be a critique with detailed notes if it’s almost entirely illegible? I believe the book is being taken seriously by scholars, the problem being that so little was known at the time of the filming. Within minutes twitter was buzzing with tweets from paleographers specialising in this period, and none of them were initially sceptical. I agree the piece on the Antiques Roadshow was contradictory but again this may have been because the expert was so excited. I’m sure that in due course we will all hear more!